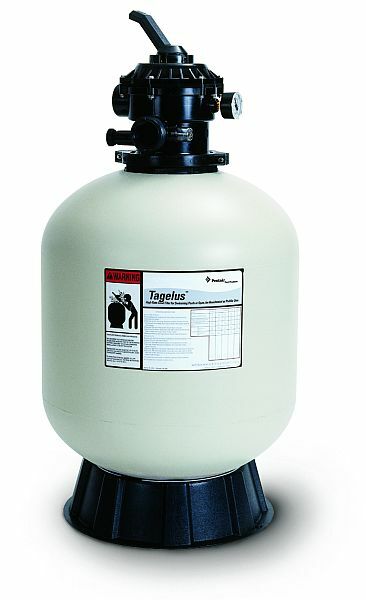 Pentair Pac-Fab Tagelus TA40D 19 Inch Sand Filter for Above Ground or In Ground Swimming Pools. Sand filters have been in use for decades which is a testament to their ease of use and reliability, but not all sand filters are equal. They do not all have design features that continuously flatten and level the sand inside the tank. The Tagelus does. Tagelus filters remove particles large and small. Some so small they are undetectable with the human eye, but in large quantities can make your water very cloudy. 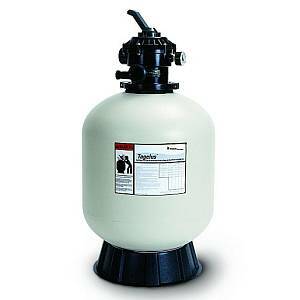 The reason so many of the Tagelus filters are bought by pool professionals is because of their proven consistency through the years. One piece fiberglass construction to deliver unmatched strength and durability. Six position High-Flow valve with manual air relief valve and sight glass. A special diffuser creates a uniform sand bed that consistently traps more dirt without interfering with the water flow or letting it flow too fast which results in better filtration and longer time between backwashings. Combination sand and water drain speeds servicing and winterizing. All internal parts are threaded for fast and easy service.